Saturday's contest between No. 11 Florida and Florida State will not have any impact on the College Football Playoff, but it does not stop me from living in the past and delivering the top 5 games of all-time on rivalry weekend. In what became known as "The Choke at Doak", Florida blew a 31-3 lead in the fourth quarter as Florida State scored 28 points in a row in an 11:15 span. Because overtime did not exist at the time, the two teams settled for a 31-31 tie and left everyone with bitter tastes in their mouths about what could have been. About a week later, the in-state rivals were selected to play in the Sugar Bowl in New Orleans, where the score would be settled once and for all. Known for the nickname "The 5th Quarter in the French Quarter", New Orleans would have to share the term with a pair of bitter rivals on New Year's Night in the Louisiana Superdome. This one proved to be the Warrick Dunn show as the Florida State sophomore tailback took home Sugar Bowl MVP honors with 14 rushes for 58 yards and nine catches for 51 yards, to go along with a 73-yard touchdown pass in a 23-17 win over Florida. Before the rise of running backs lining up at multiple spots on offense, Dunn was the trailblazer and set the course for others to follow to this day. Fresh off a national championship the season before, the Gators came into the 1997 game with a pair of losses, which left them on the outside of the national championship picture. On the other end of the spectrum, the Seminoles came into the game as the top ranked team in the country at 10-0 in one of two major polls and on the doorstep of a title. Despite FSU's defensive averaging an insane 6.4 sacks per game, Florida had other plans as the offensive line did not allow a sack as Fred Taylor ran for 164 yards and four touchdowns, highlighted by a one-yard TD, which proved to be the game-winner in a 32-29 win at Ben Hill Griffin Stadium. The win would be the highlight of a somewhat disappointing season for Florida as it would play in the Citrus Bowl, while FSU went to the Sugar Bowl. In arguably the biggest matchup in the series' history, Florida and Florida State came into the game ranked one and two with undefeated marks. 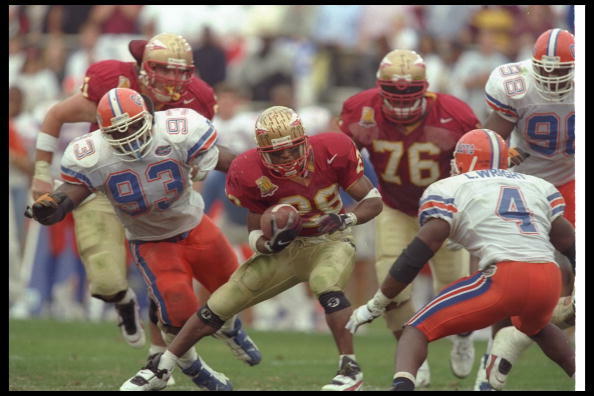 Warrick Dunn once more made Florida's defense look like a junior varsity team with a career-high 185 yards to clinch a spot to the Sugar Bowl and the national championship game in a 24-21 win at Doak Campbell Stadium. Eventual Heisman Trophy winner Danny Wuerffel engineered a 362-yard day through the air on 23-of-48 completions in the loss for the Gators. History managed to repeat itself once more as Florida won the SEC Championship a week later and found itself in a rematch with Florida State in New Orleans. The Gators got the best of the Seminoles with a 52-20 win and a national championship crown. With the BCS title picture in the rearview mirror, both teams still had plenty to play for in this top 11 matchup in Gainesville. The contest proved to be a nip-tuck affair until Seminoles quarterback Chris Rix connected with P.K. Sam on a game-winning, 52-yard touchdown reception for the 38-34 win over the Gators. The legacy of the game was written not during the 60 minutes of action, but in the postgame on-field scuffle between the two teams. Florida State celebrated at midfield, but Florida would not let them have the final say on its home turf as punches and verbal expletives were exchanged. Things got so out of hand that local police used pepper spray to disperse the parties. Shows you how much the in-state rivalry matters despite the records.